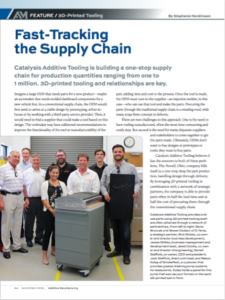 Additive Manufacturing Magazine came to our facilities over the summer to see what Catalysis Additive Tooling is all about. We are honored to be featured in their November 2018 issue! Click here to check out the wonderful article about Catalysis Additive Tooling written by Stephanie Hendrixson. What Does 3D Printing Mean To Us?